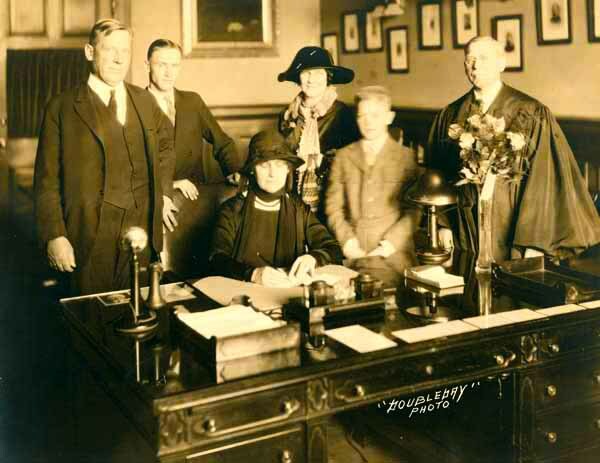 On January 5, 1925, Nellie Tayloe Ross, a Democrat, was sworn-in as Governor of Wyoming, becoming the first woman in American history to serve as a state governor. Mrs. Ross was elected through a special election on November 4th, 1924 to fill the remainder of the term for the previous governor, and her husband, William B. Ross, who died unexpectedly in office. During the brief campaign, and subsequent election, many critics denounced the idea of a woman becoming the state’s highest elected official. As the state’s chief executive, Governor Ross fought for farm aid, tax and banking reforms, increased educational funding, and worker protection laws. Despite her best efforts, the Republican controlled state legislature defeated the majority of her legislative initiatives. In an increasingly Republican leaning state, Governor Ross lost her 1926 reelection bid by less than fourteen hundred votes. After her electoral defeat, Mrs. Ross remained active at the national level for the Democratic Party, including serving as the Democratic National Committee vice-chair and director of the DNC Women’s Division. In 1933, President Franklin Delano Roosevelt appointed her as the first female director of the U.S. Mint, a position she would hold until her retirement in 1953. Papers relating to the political career and personal life of Nellie Tayloe Ross can be found at the American Heritage Center and at the Wyoming State Archives. The AHC is currently in the process of digitizing the correspondence, political papers, and photograph series of the Nellie Tayloe Ross papers, which represent approximately five and a half cubic feet of primary documents. Additionally, Ms. Ross was recently featured in the traveling exhibit, In Pursuit of Equality, which is currently being displayed at the Weston County Library in Newcastle, Wyoming. The images for this post were taken from the Nellie Tayloe Ross papers, Collection 948, American Heritage Center, University of Wyoming, and the text is a re-post from the blog, Women’s History Sources. 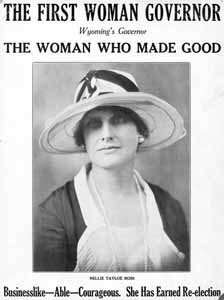 This entry was posted in resources, western politics and leadersip, women's history, Wyoming history. Bookmark the permalink.